Driving through the town square on the state highway on a snowy day, this tiny place caught the corner of my eye. 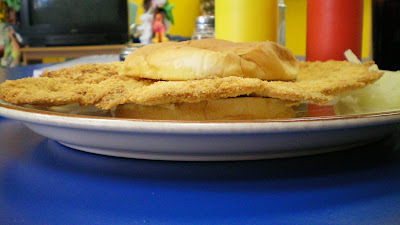 The sign on the side reads "homemade tenderloins", that was enough to pull me off the road and into this establishment. Location: 211 E. 2nd St. Montezuma, on the northwest corner of the square. Montezuma Iowa (population 1,440 in the 2000 Census) is the seat of Poweshiek County on the eastern edge of Central Iowa. 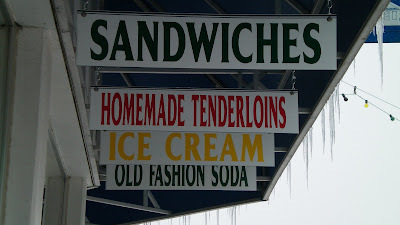 Also on the Menu: Soda Fountain malts and ice-cream, along with deli-style sandwiches and loose-meat burgers. Service: I think the owner of the store took my order and went in back to start the tenderloin. Another employee showed up later. Each seemed to know their customers by name. Ambiance: The front of the store is a food counter, the back is split between a kitchen and stock of paint supplies materials. The walls are covered in paint brushes and graphic t-sirts in the dining area. Final Thoughts: I was lucky to find this place when I was driving in the middle of a snowstorm in January. Many ice-cream and soda fountain places close for the winter and re-open about when school is let out. 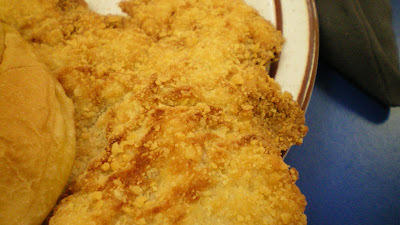 If you like wide and thin tenderloins, this one is for you. Looks good to me. Thanks for doing these. E-mail me about a possible new writing project. Wow! 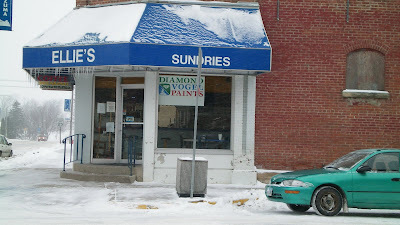 This is my mom's store! 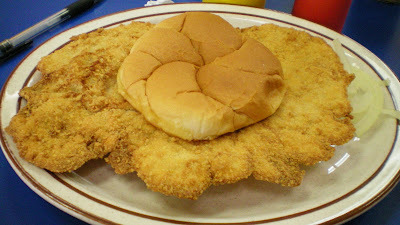 I worked at Ellie's all through high school and the tenderloins are definitely gigantic! Stop in and have an old fashioned Root Beer float when you are in the area. It's not there anymore. I tried to go there yesterday and it was a Mexican Restaurant. But there was a "Dairy King" about a mile back towards I80.